Buddha's face is illuminated by the golden glow of a lotus blossoming under the Bodhi Tree. Buddha attained enlightenment under this holly tree. The open lotus signifies full enlightenment. 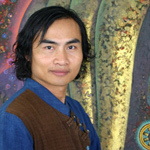 For the artist, the Bodhi Tree sheltering the lotus symbolizes this moment. 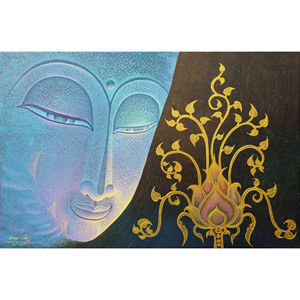 A follower of the dharma, or Buddha's teachings, Rawat Vongla portrays a serene moment of introspection with Buddhist symbolism. Painted and signed in 2004.